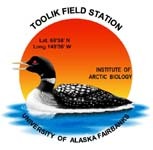 » Toolik Inlet Discharge Data collected in summer 2007, Arctic LTER, Toolik Research Station, Alaska. For discharge measurement protocol, see the Land-Water protocol accessible from the Land-Water mainpage on the Arctic LTER web page or at http://www-personal.umich.edu/~gwk and clicking on the protocol link at the bottom of the page. Water level was recorded continuously with with a Stevens PGIII Pulse Generator connected to a Campbell Scientific CR510 datalogger. Additionally, we deployed a Campbell Scientific Model 247 Conductivity (EC) and Temperature probe which also recorded to the CR510. Discharge measurements were taken throughout each season to determine the stage-discharge relationship. When the stage heights exceed our range from the study year's rating curve, we apply a standardized composite rating curve (from 1991-2006) for Toolik Inlet to solve for stream discharge. Adjusted discharge measurements based on two rating curves, the Yearly and Composite. See Methods. Version 2: Updated units to current standards. Updated metadata form to newer version (without site sheet). CH 4Feb2013 Updated to newer metadata form (with sites sheet) Ch March 2013. February 2016. Changed file with Dataset ID *.01 to Dataset ID *.02. The discharge measurements were corrected based on updated rating curves, removed the variable "stage height" because this is a relative measure not comparable across years, rounded Temp, cond, and Discharge. See Methods.